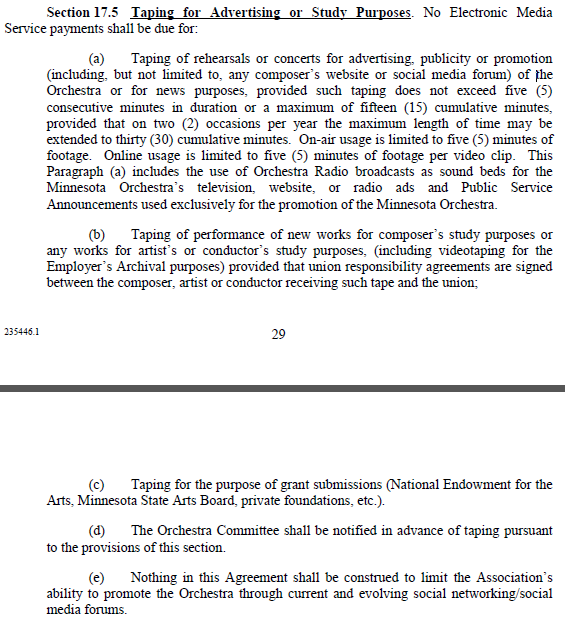 The other night while waiting for lockout news, I decided to prove my nerdiness by comparing the two contracts the Minnesota Orchestral Association (MOA) has offered its musicians. They’re on their website, and you can find the first one here (Contract A) and the second one (the “final offer”) here (Contract B). So I opened up two Adobe Reader windows and went line by line through both fifty-odd-page documents, determined to find where management had agreed to compromise, and by how much. I may have missed some small changes here and there; if I did, alert me, and I’ll add them to this entry. But I’m pretty confident I caught the majority of them. 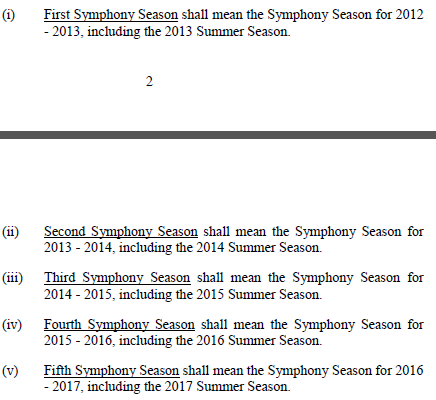 This is actually the first orchestral contract I’ve read in full, and so I’m obviously not qualified to discuss the implications of all the changes, but when I did have something to say, or questions to ask, I wrote a little paragraph underneath the screen shots. I’d appreciate if someone fluent in legalese could discuss the implications of the changes. So they added in the dates. Nice. Change number two…also consists of adding in dates. 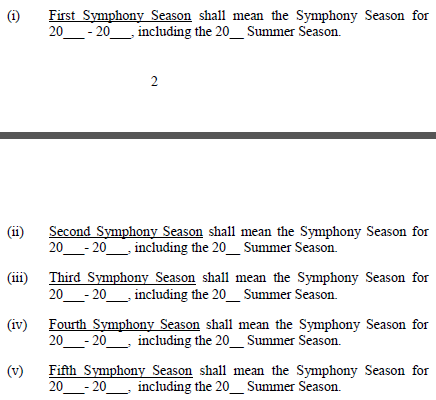 So it looks like in Contract A, musicians are to work no fewer than 38 weeks and no more than 42 weeks. Contract B alters that to just plain old “shall be expected to” work 42 weeks. Discussions of community outreach. It goes from “in any season” to “in any 42 week season.” Management also adds in an (s) after rehearsal. Here are some free days built into Contract B that were not in Contract A. This sentence is only in Contract B, and strikes me as being one of the most interesting changes of all. On the Minnesota Orchestra Musicians website, I’m counting 15 first violins (with two on leave of absence), 9 second violins, 10 violas (with one on leave of absence), 10 cellos (with two on medical leave), 6 bass players, 4 flutes, 3 oboe, 4 clarinet, 4 bassoon, 5 horn, 4 trumpet, 2 trombone, 1 tuba, 2 timpani, 3 percussion, 1 harp, and 3 librarians (with one as a substitute). That adds up to 86, with two of those players now in the Oregon Symphony, one in the San Francisco Symphony, and none of the three very likely to return. And then the one substitute librarian. What happens when the number dips below 84, as it looks guaranteed to do even if nobody leaves? (And I can guarantee you, people will leave…) Will management face any consequences for failing to hire new players, or be forced to agree to an accelerated schedule of auditions to fill vacancies to keep the orchestra at the magical 84 number? Or is this a largely symbolic provision with no teeth to enforce it? And…another change having to do with dates. So in a 52-page contract, we have approximately 14 fleeting changes (although your exact number will vary depending on if you feel the changes should be counted per sentence, per paragraph, per line, per section, etc). Three of those changes have to do with dates. So really there are only about 11 changes. 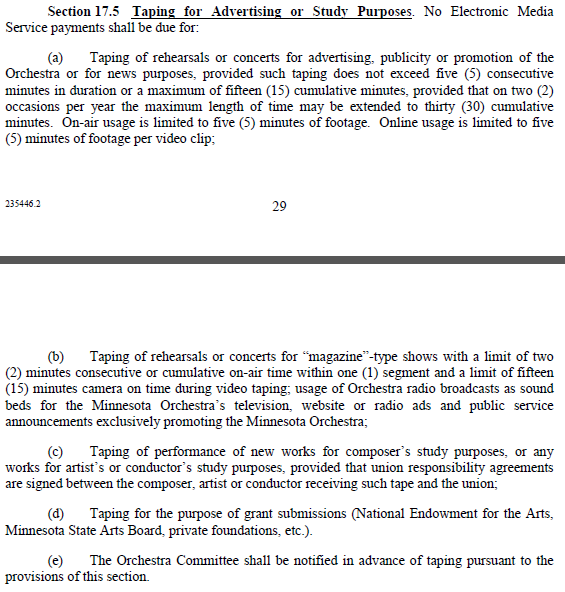 Compare that to the 250+ changes the musicians say management has made from the old contract. So I don’t think it’s unreasonable to assume that management’s Final Offer is probably about 95% of what they originally wanted, change-wise. Rick: Wow, here’s a valuable car I really, really, really want to buy. It’s amazing. Wow. This is world-class stuff right here. Yes, I’m very interested. What do you want for it? Client: I was thinking $10,000. Rick: WHAT? Um, no. No, no, no, NO, NO, NO. Absolutely positively no way. How about $100? Rick: $100. Sorry man, times are tough. Client: Can you, um, do any better than that? Rick (five months later): Here is my absolute final offer. Rick: It’s totally respectful and realistic. Rick: I will give you 5% of what you want. So $500. Rick: What is your problem? I’m so disappointed you aren’t working with me! I’m being reasonable and generous and incredibly respectful! Why are you driving away in your awesome car that I said I totally wanted??? Why doesn’t anyone want to negotiate with me??? Fine. Whatever. I’ll just close the shop till Thanksgiving while continuing to pay myself $1100 a day. See if I care. Geez. If you have only 11 relatively minor changes to share, why would you post two separate 50-page PDF documents? Or, phrased another way, why wouldn’t you post a short errata to make your positions as clear as possible? It couldn’t possibly be to confuse Joe Patron, who is most likely elderly, and probably doesn’t know how to work Adobe Reader, or tile the windows on his computer so he can read both documents at once, and probably doesn’t have good enough eyesight or the physical ability to sit and spend a couple hours skipping back and forth between the two contracts for fifty pages. It couldn’t possibly be to give Joe Patron the impression that management is engaging in good-faith dialogue and agreeing to lots of substantial changes, when really there are only a handful of them. It couldn’t possibly be to overwhelm a local news media that’s already overwhelmed with negotiation news and simply doesn’t have the time or resources to devote to comparing the two contracts. Because management would never ever do that to its devoted public, right? The very same public who makes Michael Henson’s $404,000 annual salary possible, right? Nobody could possibly do that in good conscience…could they? So what’s the alternate explanation? Wow, Emily. I’m glad you did this. I haven’t had a chance to read it carefully — I actually downloaded the two contracts also to do this — but plan to. I think it’s important to put up front in your first paragraph what your conclusions were about the changes — were there substantive changes (from what I’ve read so far, no), and how do you characterize the changes (correcting typos, changing dates, correcting name misspellings and other misspellings, etc. or “yeah, here they offer to cut Management’s salaries, too!”). Then go on to show the detail….. This is amazing work. Thanks!! !